Following the closure of the Fast & Furious Extreme Close-Up Studio Tour attraction in 2013, and the success of the immersive movie environment of King Kong 360 3D, Universal Creative have chosen to go 3D with their all-conquering 4-wheeled franchise. This is an excellent climax to the Studio Tour. Building on the success of King Kong 360 3D this ride uses a variety of different techniques to immerse guests in the Fast & Furious world. The narrative begins when the Studio Tour guide spots a black 1970 Dodge Charger just up the hill from the Chicken Ranch, next to the House of Seven Gables. The guide radios security, who appear magically on the monitors in the trams. It quickly becomes clear that the car is of considerable interest to the FBI, who have been looking for it. They reveal the driver is one Dominic Toretto (who fans of the Fast & Furious movies will recognise instantly, as the character portrayed by Vin Diesel). Security: “OK tour, I’ll send someone down to check it out ASAP”. The tram is driven into a ‘well-known street racer party hangout’ on the backlot for safety. This section is led by Roman Pearce, who appears on the Tram monitors. The tram pulls forward to reveal a full-on dance party in full swing. Each individual tram car is blocked in (for safety, presumably) so the guests have a more enclosed view of the party. Screen for the Chase scene is a single compound curved screen nearly 400 feet in length and 40 feet high, to fully encircle Studio Tour guests. There are a total of 34 4K projectors used on the attraction. “Fast & Furious—Supercharged” features the world’s longest 3D projection installation ever created, wrapping the length of the venue with one continuous screen designed to envelop Studio Tour guests in the exploits of perilous street racing. Built to immerse guests in unprecedented realism, the ride debuts a custom-built compound curved screen spanning nearly 400 feet in length and 40 feet in height, and configured with 34 of the most technologically advanced 4K projectors. Featuring a combination of live actors shot against green screen special effects and unrivalled photo realistic imagery, the ride’s media will alter the guest’s perceived reality to deliver a convincingly real world, putting guests in the driver’s seat. The seamless integration of 3D imagery on the largest, most expansive 3D screen ever created—with a highly intense directional sound system and precision synchronized movements—will redefine theme park ride immersion. Scene Three, the Dance Party, features an excellent use of Musion Eyeliner projection surface. The ‘screen’ is a thin layer of reflective foil, which is almost completely transparent, allowing you to see straight through it to the lights and other set pieces beyond it. It’s been used to create so-called ‘hologram’ appearances of performers at a variety of different events. The projections appear fully 3D because we can’t see the projection surface, so our brains are not able to process them as 2-D figures. When seamlessly integrated with moving scenic pieces (as when Dominic Toretto rides the urban assault vehicle up into view), the illusion is complete. The powerfully immersive surround sound resonating throughout the attraction will be an acoustic achievement that utilizes the latest audio technology to envelop guests in the world of “Fast & Furious.” Orchestrated in tandem with non-stop action sequences on the massive screen and synchronized to the tram’s movements, the energizing score and audio effects will deliver a considerably more impactful and astounding experience. The ride’s superior sound system will produce 80,000 watts of sound from 56 highly-efficient speakers and 44 discrete audio channels strategically situated throughout the attraction and behind the giant screen. At 108 decibels, the ultra-crisp sound effects will intensify the impact far beyond the typical movie-going experience. Unique to the ride’s advanced sound system is the ingeniously designed perforated screen, dotted with millions of tiny holes to amplify sound and produce a multi-dimensional stereophonic soundscape. In mid-2014, “Fast & Furious—Supercharged” went into production on location at a giant soundstage facility in Playa Vista, California. The films’ stars – Vin Diesel, Dwayne Johnson, Michelle Rodriguez, Tyrese Gibson and Luke Evans – joined Universal Creative in an elaborate green-screen special-effects shoot to capture the breathtaking stunts and action sequences for the media portion of the ride. The action sequences were later composited into a selection of HD scenic images that were shot in and around Los Angeles to deliver hyper-realistic imagery and interactions with real environments as opposed to fabricated CGI images. As of April 2015, the show building was complete externally, and the interior of the huge building was starting to take shape. Universal City, California, June 23, 2015 – Vin Diesel, Michelle Rodriguez, Tyrese Gibson and Jason Statham attended today’s red carpet premiere of Universal Studios Hollywood’sSM all-new thrill ride, “Fast & Furious—Supercharged”, and were among the first to experience the attraction, which debuts as the grand finale to the world famous Studio Tour. Also attending were Fast & Furious series filmmakers Neal H. Moritz and Chris Morgan, who were joined by Steve Burke, CEO of NBCUniversal; Ron Meyer, Vice Chairman, NBCUniversal; Tom Williams, Chairman, Universal Parks & Resort; Larry Kurzweil, President and COO, Universal Studios Hollywood; Mark Woodbury President, Universal Creative; and L.A. Mayor Eric Garcetti. This dynamic new ride, inspired by Universal Pictures’ blockbuster film and featuring cast members from the series, including Vin Diesel, Dwayne Johnson, Michelle Rodriguez, Tyrese Gibson and Luke Evans, is a technologically advanced mega-attraction designed to catapult guests into the high-stakes underground world of street racing at perceived speeds of 120 miles per hour. A high-octane adventure, “Fast & Furious—Supercharged,” is conceived as a new installment to the Fast & Furious franchise that can only be experienced at the Entertainment Capital of L.A. The ride opens on June 24, 2015. 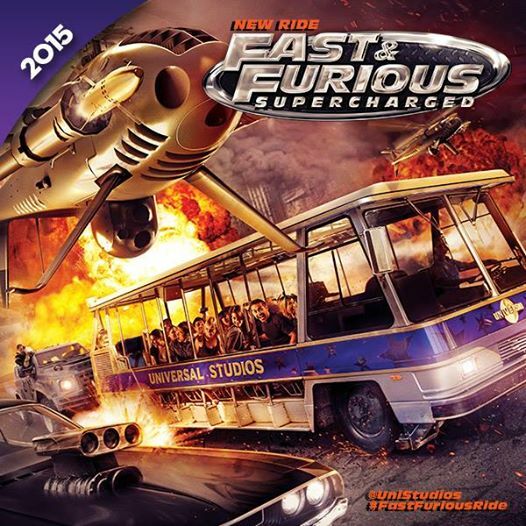 An exciting hydraulic motion-based ride, “Fast & Furious—Supercharged” tells an original Fast & Furious story. The attraction fuses sophisticated special effects with a state-of-the-art 3D audio system and 3D-HD imagery projected onto the world’s longest and most expansive 360-degree screen. Spanning nearly 400 feet in length to encircle Studio Tour guests within a newly constructed 65,000-square-foot structure on the legendary backlot, the sprawling custom-built screen employs 34, 4K projectors and a specially configured projection system to envelop guests in unprecedented realism. Coupled with an intense blend of thrilling visceral effects, “Fast & Furious—Supercharged” takes guests on a wild ride that begins the moment they board the Studio Tour. Exclusive interstitial content filmed with cast members is featured on the tram monitors, highlighting interactions as the cast engages guests en route to the climactic ride. Along the tram route and featured at the ride, sightings of numerous prop cars from the Fast & Furious series, including Dom’s iconic Dodge Charger, enhance the story. The Moving Picture Company was awarded Outstanding Visual Effects in a Special Venue Project for their work on this attraction.